Smartphone coupons scare the heck out of most restaurants. The biggest fear – nothing to track. Many don’t care if your customers stop in to use a coupon offer multiple times. Driving more revenue is a good thing. What drives you crazy is employees giving coupon discounts and your customer never even knew about the coupon. That’s why restaurants still require printed coupons or the manager is required to verify the customer had the coupon and key in the discount. Customers want the convenience of digital coupons. Surely there has to be a way to create digital coupons that are safer for the restaurant and more convenient for the customer. It shows the 1-2-3 of the verification process for smartphone coupons. Your customer shows your staff the coupon on their smartphone. Your staff asks the customer to touch the green button and confirm to redeem the coupon. Your staff records the last three digits of the “Code” displayed on the customer’s screen. The process takes 2-3 seconds. No manager involvement during the transaction. The 3 digit code is unique and random so employees can’t guess. The codes are recorded in the coupon system the employee doesn’t have access to. The manager can verify the code during slow times. The only way the code is recorded in the coupon system is the customer had to have the coupon. Now that the coupon is digital it can do a whole lot more for your business. Where can you use these coupons? In your email marketing blasts. Do the coupons work with all email marketing systems? Are the coupons mobile friendly? Coupons are designed for mobile screens. How do you create the coupons? We create them for you. And give you the URL. Who creates the unique codes for the coupons? Is there a limit to the number of codes? 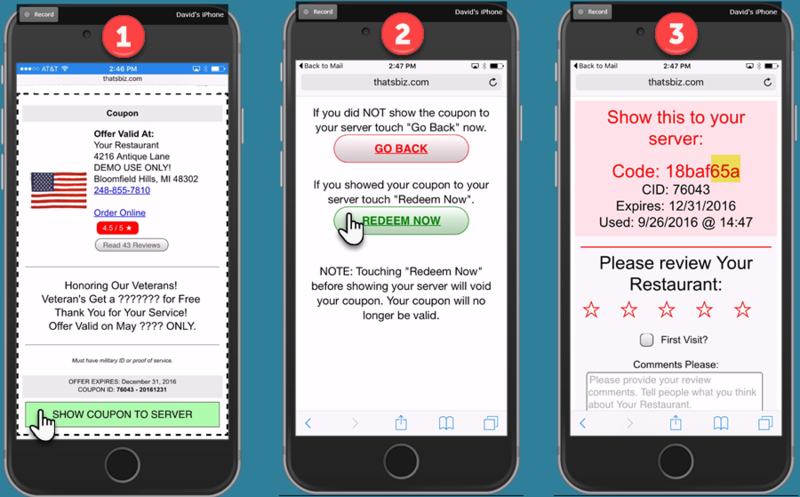 Is the POS system required for coupon verification? Is any special hardware required at the counter? Are there any text limitations for the offer and restrictions? Can the valid locations be listed on the coupon? Where does the Online Order link on the coupon point to? The online ordering page on your website. If can point to a specific location’s page. If the green button doesn’t work – it’s a fake. Checks to make sure the coupon is not expired when the customer touches the green button. Tracks clicks and redemptions by coupon. Tracks where the customer found the coupon – email, Facebook, Twitter, etc. What about other tracking such as location, type of offer, type of location, etc? We can show you how to categorize offers to support creating custom audiences for ad remarketing and for data analysis. What about Facebook Ad pixel code? We can add it to your coupons. What about Google Ad tracking code? Can you track coupon conversions by source (Facebook, Twitter, Email, etc)? Can customers share the coupon with friends and family? What’s about the Feedback Survey on the last screen? Where do the feedback results go? Emailed to whomever you designate. 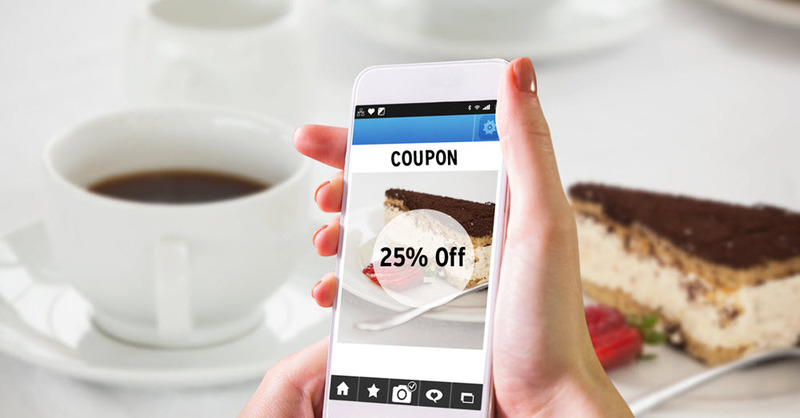 Delight your customers and start accepting coupons on smartphones. Delight your bottom line knowing your staff is only giving coupon discounts to customers that had the coupon. If you would like a price estimate to use smartphone coupons in your marketing please click the button below.